"Stay crunchy to the bottom of the bowl." One of my favorites was Post Grape Nuts Flakes. Man, I'm gettin' old. I remember them. They weren't bad. 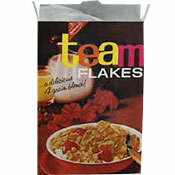 TEAM is one of my favorite cereals from way back when.